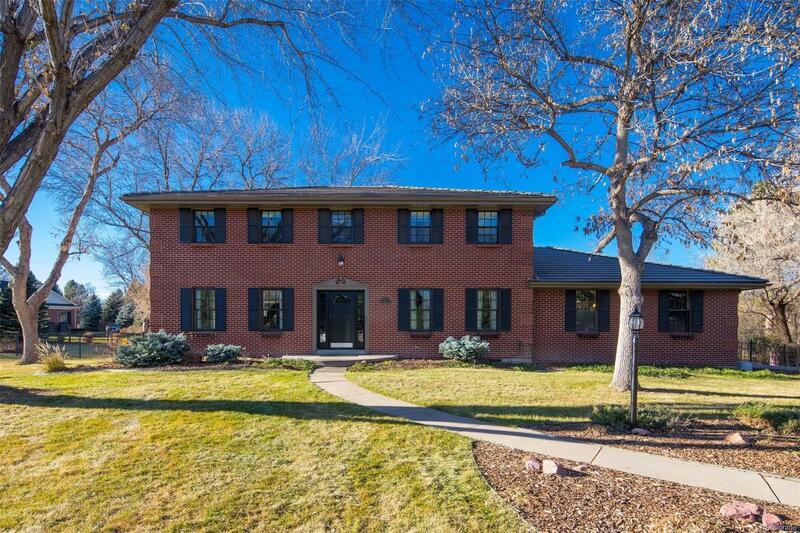 Classic Georgian inspired two-story on over 1-acre lot in highly coveted Brookside neighborhood. Traditional plan features generous living & entertaining spaces paired w/ updates that blend well with the original charm & character of the home. Stunning 2017 remodeled kitchen features quartz counters, a 10â island, custom cabinetry, secondary prep station, and a breakfast bar. The adjoining great room w/ beamed ceilings offers a cozy gathering place w/ gas fireplace and views of private backyard oasis. Newly remodeled mudroom provides transition to the garage plus a laundry room. Beautiful master suite w/ fireplace and a gorgeously upgraded bath. 3 add'l bedrooms feature oversized closets and an updated hall bath. Recent basement updates include two bedrooms (non-conforming), an updated Â¾ bath, and family room. Cherry Creek schools (Cherry Hills Village Elementary, West and Cherry Creek HS) -nearby Highline Canal trail - easy access to dining and transport, all make this location ideal.